Salt Lake City, UT – September 24, 2014 – Monnit Corporation (www.monnit.com), today announced a new low-power wireless carbon monoxide sensor. Monnit’s new wireless carbon monoxide (CO) sensors are the only sensors available in the industry that can be powered by a single coin cell battery while maintaining premium performance specifications and long life. Imminent danger of CO poisoning is a growing concern in the care for elderly, child and immuno-compromised individuals. Monnit’s wireless sensor platform and online monitoring software provide a very affordable, simple-to-setup, feature rich solution that helps meet the growing demand of legislative and public concerns regarding the monitoring of gas leaks and emissions. Las Vegas, NV and Salt Lake City, UT – September 11, 2014 – Monnit Corporation (www.monnit.com), a leading provider of wireless monitoring and sensing solutions, announced today at the cellular industry tradeshow, CTIA, the immediate availability of the new Monnit Cellular Partner Program. The new Cellular Partner Program allows for cellular companies, big and small, including MVNOs, to reference sell, resell or private label Monnit wireless sensor systems to commercial and light industrial customers alike. Monnit has experience in and is capable of carrier certification. Monnit’s wireless sensors and gateways have received global certifications – FCC and IC for use in the US and Canada, as well as CE and ETSI for Europe, making them suitable for global use. “Mobile carriers around the world are now enabled to offer their customers the robust, reliable, Monnit remote monitoring solutions with their cellular connectivity. Our sensing and monitoring solutions are designed to bring businesses efficiency, effectiveness, and a fast return on investment where information about environmental, operational and process data is important.” said Nick Mecham, Executive Vice President, Monnit Corporation. Monnit’s wireless sensors are designed to detect and monitor functions that are critical to business, including; temperature, humidity, water, light, access, movement and much more. Monnit cellular gateways transmit data between local sensor networks and the iMonnit online monitoring and notification system using cellular network communication. Monnit’s software allows for user customization, and notification of events via SMS text and/or email message. Monnit’s cellular gateways have been designed to be compatible with current and future cellular protocols such as CDMA, GSM and LTE, thus allowing for a simple and reliable migration path for carriers and their customers. For more information on Monnit’s Cellular Partner Program, call (801) 561-5555 or email busdev@monnit.com. Monnit is a leader in the design and manufacturing of turnkey, self-installing, low cost wireless sensor solutions targeted at the commercial and industrial markets. Monnit’s sensing solutions are easily installed and used by anyone wanting to remotely monitor information and activities around a variety of variables (i.e. temperature, motion, humidity, vibration, etc.) and receive alerts based on user defined conditions. OEMSensors.com, a division of Monnit Corp., brings an award winning, fully tested, FCC, CE and IC compliant wireless sensing and monitoring platform to those wishing to private label the solution or easily integrate it into existing systems, products and services. Be sure to visit Monnit in Booth# 6830 at CTIA – Super Mobility Week, September 9-11, 2014 at the Sands Expo and Convention Center in Las Vegas, Nevada. Monnit provides an extensive line of wireless sensors, gateways and software for commercial, industrial and OEM applications. Executives will be on hand to answer questions and show you how easy it is to get started with a complete wireless sensor solution. If you would like to schedule a meeting with us at the show click here. For more information on the show or to register, please visit www.supermobilityweek.com/. Salt Lake City, Utah – September 05, 2014 – Monnit Corporation (www.monnit.com) today announced the release of three new low cost wireless voltage sensors designed for commercial, industrial and consumer applications. The new sensors complement Monnit’s existing line of successful low-cost wireless sensors, introducing new capabilities for customer applications. Wireless 0-5 Volt DC Measurement Sensor connects to the power and ground of any voltage source and measures voltage within stated accuracy up to 5 VDC. Wireless 0-10 Volt DC Measurement Sensor connects to the power and ground of any voltage source and measures voltage within stated accuracy up to 10 VDC. Wireless DC Voltage Detection Sensor detects the presence or absence of electricity up to 50 Volts DC. The new voltage sensors are capable of either detecting voltage (when power is on or off), or measuring the voltage of a power source by connecting the sensor’s wire leads to the positive and ground terminals or power supply line. These three new sensors are all rated for DC voltage use and cannot be used for AC voltage. Monnit provides other products designed specifically for AC voltage use. Focused on simplicity, Monnit wireless sensors can be setup, gathering data and notifying users of concerns in just a few short minutes. The new sensors are available in standard coin cell and AA battery powered commercial formats, as well as in an industrial (weatherproof/dust proof) format. All of Monnit’s commercial and industrial sensors are available in global RF frequencies (900, 868 and 433 MHz) allowing them to be used globally. Monnit’s wireless sensors are designed to detect and monitor functions that are critical to business or personal life, including; temperature, humidity, water, light, access, movement and much more. Monnit’s wireless gateways transmit data between local sensor networks and the iMonnit online monitoring and notification system. Monnit’s software allows for user customization and notification of events via email or text messages. All of Monnit’s wireless sensors include free basic iMonnit online sensor monitoring with SMS text and email alerting. For more information on Monnit sensors, gateways and monitoring call (801) 561-5555 or visit www.monnit.com. This tech-tip is meant to give instructions for creating and scheduling sensor or network reports in the iMonnit online sensor monitoring software. For product documentation and additional help visit www.monnit.com/support. Monnit has recently released to Beta a new “Scheduled Reports” feature for our iMonnit online software customers. 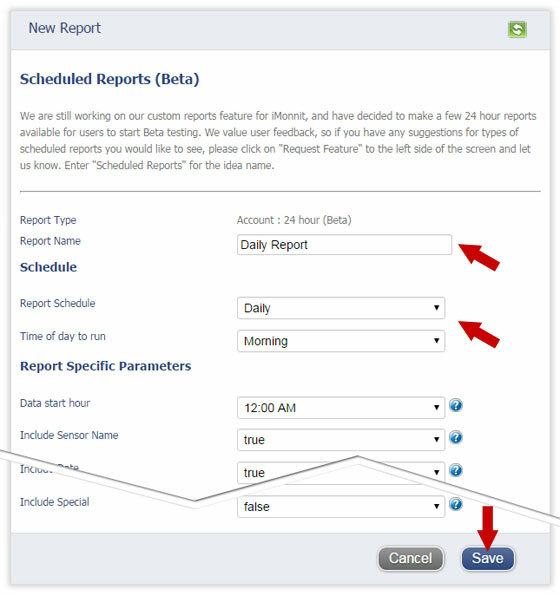 The scheduled reports function allows users to setup a one time or recurring report to run at a set time. Scheduled reports are sent via email and include a system generated CSV file containing the specified sensor(s) and network(s) data. To create a new scheduled report, login to your iMonnit account at https://www.imonnit.com. Clicking on “Reports” in the main navigation will bring you to the reports section of the iMonnit system. 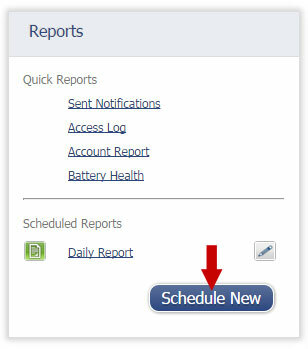 Select “Schedule New” from the left navigation on the Reports page to create a new scheduled report. Click on “Schedule” next to the type of scheduled report you want to create. Sensor : 24 hour – Reports data from a specific sensor for the previous 24 hours. Account : 24 hour – Reports data from all devices on the entire account for the previous 24 hours. Name the report and select the schedule and time of day to run the report, then select all other options that you want to include in the report. When you are finished, click the “Save” button. You can also choose to send the report immediately by choosing the option under “Report Schedule”. Choosing the immediate report option generates a one-time report and sends it to the specified email. After clicking the “Save” button, you will see a verification page for the report settings. At the bottom of this page you can select user’s on the account to receive the report. If you are using the free iMonnit software there will be no other user’s on your account. By default the logged in user creating the report is already added. To select additional user’s, check the box in front of their name and click the arrow button to move the users to the recipient list. Any time a recipient is added or deleted, the list is automatically saved and the report remains active. With the report created you can Activate/Deactivate the notification by clicking on the report icon in the left navigation (1). You can also view the report settings and edit which users will receive the report by clicking on the report name (2), and can make changes to the report settings by clicking the edit icon (3). Wood flooring in high humidity areas can absorb moisture when there are excess amounts of it in the air. Humidity fluctuations can result in floor boards swelling and either cupping or crowning, which can make the floor look disjointed and uneven. Damaged floors aren’t pretty and can become tripping hazards. With recent extremes in both temperature and humidity, we have seen a lot of businesses seeking a remote monitoring solution for maintaining their own and/or their customer’s wood flooring. Humidity Sensors Monitor humidity and alert of conditions that can cause problems. Water Detection Sensors Detect immediate presence of water around sinks, faucets, toilets, water heaters and other plumbing before water damage can occur. Temperature Sensors Monitor temperatures and track fluctuations that can cause damage to wood flooring. All Monnit wireless sensors come with free basic online monitoring, allowing you to view sensor information anytime from anywhere. Receive instant notifications via email or SMS text if a set sensor condition is met or exceeded. 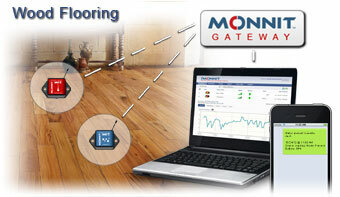 Protect Your Wooden Floors with Monnit Wireless Sensors!